While wandering around SM North EDSA’s annex after dinner at Persia Grill, me and my friends passed by an interesting stall at the 5th floor. The stall was called Miguelito’s Fried Ice Cream. The thought of “fried ice cream” wasn’t really weird for me, because I’ve had deep-fried ice cream before—ice cream wrapped in batter then deep fried. However, I soon learn that this was no deep-fried ice cream—this really was “fried” ice cream, and the thought made me very interested. Upon learning how cheap it was, we decided to try it out. There were plenty of flavors to choose from—practically anything you can find from the peddled dirty ice cream and some of the common ones you get from Selecta or Nestlé, such as double dutch and black forest. The main difference is they come in powdered form. The server blends it with water and then “cooks” it on a cold pan, spreading it out onto a large, thin pancake shape. The mixture freezes and then scraped into rolls of ice cream. You then get a choice of syrup and one topping for the 25 Php cup, again, with plenty of choices to choose from. 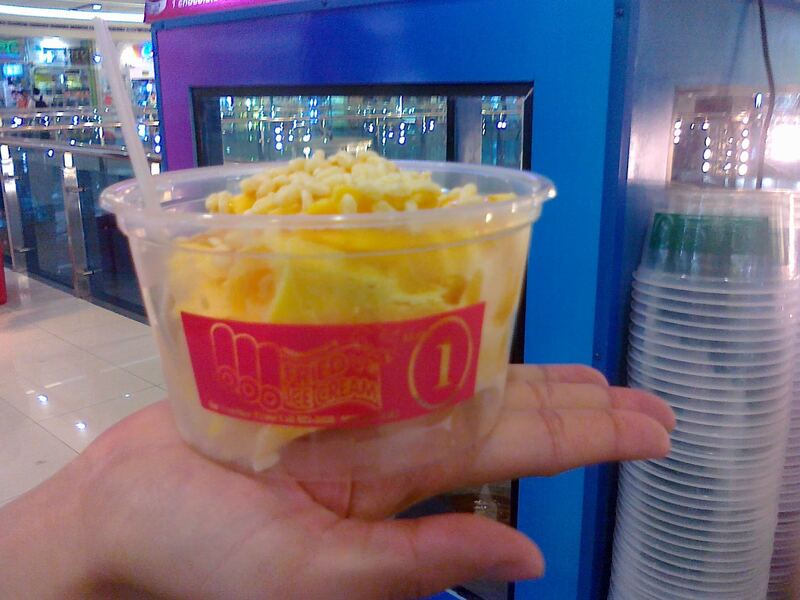 I had a cheese-flavored one with caramel syrup and rice crispies. For 25 Php, it was a steal. The amount of ice cream was comparable to the 60+ Php gelato and yogurt cups I’ve had. I found the ice cream’s texture weird at first—almost like eating cheese ice cream-flavored paper. Pretty soon, I get used to it, and I found myself enjoying the wonderful treat. I could do without the syrup and rice crispies, but they are certainly a most welcome addition, adding a notch of sweetness and a bit of a crunch. Sometimes, the most surprising food comes from the cheaper side stores. I admit that I’m fond of the juices and fried noodles with siomai at MRT stations. This one is no different from them: if the juices are meant to sate your thirst, and the fried noodles to sate your hunger, this affordable treat is guaranteed to sate your sweet tooth. And it does that in a unique and fun way. It is fun in the process of watching it turn from powder to shake to ice cream, and also fun in eating a weirdly shaped ice cream. Still, in the end, it’s still ice cream. But in such a time where overpriced gelato and yogurt defines what’s “in”, the affordable Miguelito’s Fried Ice Cream is certainly a much welcome and perhaps a most needed difference. Recommended for: Ice cream lovers. Not recommended for: Weight watchers. Smart nomnomnom tip: Eat it quick! It’s difficult to consume when it melts.